In September, being a predominantly summer month, it allows to take advantage of the light and colors of the hottest season. This is because it’s a period that allows to organize a traditional ceremony or something original, maybe even outdoors. So that the dream becomes reality, you need to know some important information to organize in the best way your dream wedding in Lipari in September. Which are the features that make September the ideal month to get married? Bright during the day, romantic in the evening. The temperatures go down and you can live better your grand day. For a September wedding, there are many fantastic ideas, a traditional party indoors or something more original in the open or at the beach. I suggest to opt for a morning ceremony. The days are a bit shorter respect to the previous months and it’s indicated to consider this so that you can enjoy the hours of light. If you’re thinking of getting married at the beginning of the month, the temperatures are higher and it’s still possible to choose light dresses, in chiffon. Thin straps or dresses without straps still will do but it’s better to equip yourself with a stole. Regarding the bride’s shoes, yes to sandals and open toe, but remember to think about an extra pair for any eventuality. Your guests will thank you: a September wedding avoids the intense summer heat. 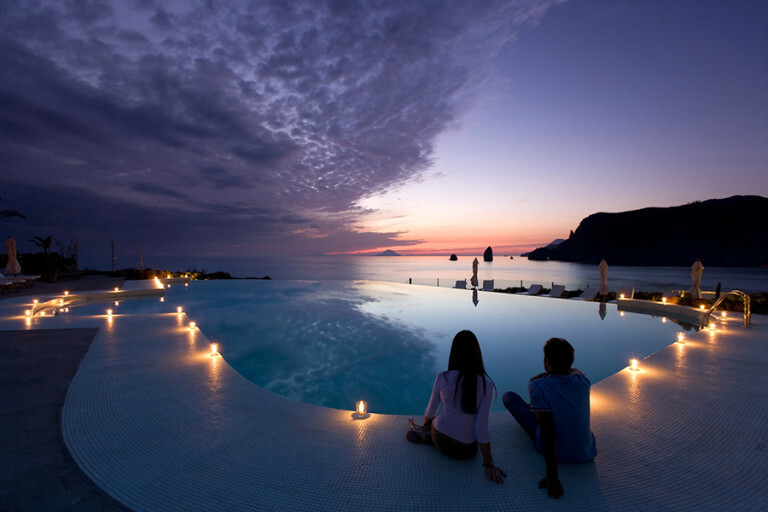 Last, but not least, is the honeymoon, that is to choose a place to extend your summer holiday. The first locations that come into my mind, considering that we are at the Aeolian Islands, is the island of Filicudi, unmissable is the sunset from the coast to the rock La Canna and in the background Alicudi, and the fraction of Ginostra, a little village on the enchanting island of Stromboli, the most northern island of the Aeolian Archipelago. Here cars are not contemplated, the quietness is total and it surely is the most original destination in the Mediterranean. The Aeolian Islands allow you to extend in the best way your summer holidays in the name of sun, sea and relax, fascinated by the wild scenery, from the crystal waters and by the peculiarities that characterize every single island. Being seven islands, who wishes can spend their honeymoon making a hop on your favorite island. Getting married in September is the right choice! Are you ready to live the day that you have always dreamed about wrapped by the hot and romantic atmosphere of the end of the summer?